The demand for qualified STEM talent is urgent; opportunities in STEM fields are expected to reach more than 2.7 million openings in 2020. And, in the not-so-distant future, all careers – whether they’re in engineering or marketing, blue-collar or white-collar – will require STEM skills and digital literacy. As more industries become reliant on STEM and tech-savvy talent, the disconnect between our students’ STEM education and hiring managers’ expectations becomes more worrisome: 67 percent of U.S. executives expect to choose job candidates with data skills over those without, yet only 23 percent of educators believe their students will graduate with these essential tech and analytical skills. Perhaps the sector best poised to positively impact today’s young people is the business community, which clearly has skin in the game when it comes to the future workforce. Companies have a meaningful role to play in building the next generation, including reshaping their corporate responsibility strategies and staff training and retention programs to build their future employees’ skills. 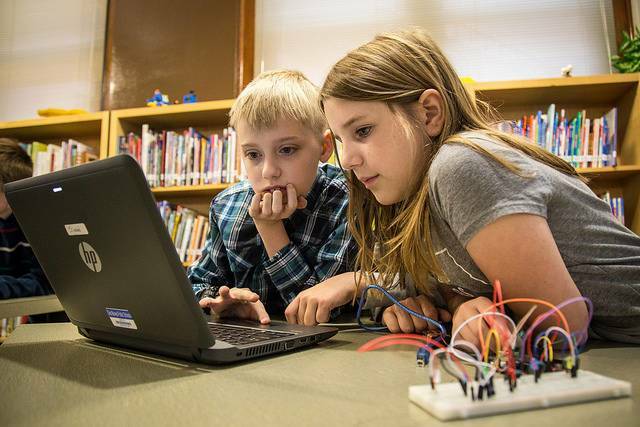 Many organizations have already built corporate responsibility and employee engagement programs around digital literacy and STEM education, but the need to make these concepts the cornerstone cannot be overstated. These initiatives should focus on more than philanthropy – they should be about changing the status quo and doubling down on mentorship while supporting hands-on learning. Creating real change for students should be a priority and can simultaneously create positive implications for business: students will have favorable perceptions of the companies that aid them, making it more likely they will look to these organizations when it’s time to enter the workforce. Qualcomm: This tech company’s STEM-centric CSR efforts focus on driving education at all levels and expanding opportunities for underrepresented students. Its strategy utilizes both owned efforts – like its San Diego Thinkabit Lab and QCamp programs – and strategic partnerships with organizations like FIRST and the Institute of International Education. By working in tandem with like-minded organizations, Qualcomm is able to make a larger, longer-lasting impact on improving the talent pipeline. Booz Allen Hamilton: Concerned about the small proportion of STEM jobs held by women – especially women of color – Booz Allen Hamilton launched its STEM Girls 4 Social Good program to bridge the talent gap. This program invites young women to learn STEM concepts while exploring problems related to social good. The company uses its core competencies in consulting, technology, and engineering to boost professional STEM mentorship for young people, a goal it achieves through long-term relationships with organizations like FIRST and Girl Scouts Nation’s Capital. These are just a few examples of the types of purpose-related initiatives making a difference in the lives and futures of young people across the U.S. and throughout the world. By getting more young people hooked on STEM, companies can play an active role in improving kids’ career outlooks and maturing their own labor pipelines. I’m optimistic that more companies will infuse relevant STEM engagement and digital literacy initiatives for young people into their corporate responsibility and employee engagement strategies. At the end of the day, these strategies will benefit companies just as much as they impact the lives of the young people they touch. If organizations want to get – and stay – ahead, they need to act now and make a meaningful difference in students’ education journeys.